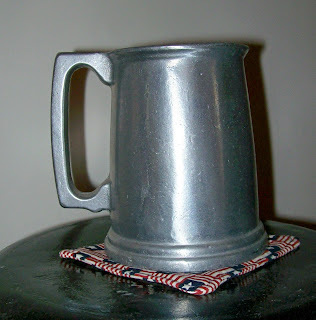 I made some coasters for the season....Flag Themed....and had this funny little story going through my head....read on for the adventures of Uncle Stuart....and my goal of blogging EVERY day. She opened her mailbox and saw the package from Pandys of Lake Sunapee. Ripping the envelope open, she grabbed the coasters and practically hugged them. Yes, Yes, Yes, she said, then looked around quickly to make sure no one had heard her. Last year, at the Memorial Day cookout, Uncle Stuart had had a few too many and thought tossing her marble coasters into the pool for the kids to dive for would be a great game. Somehow, a wine glass ended up in the pool, too. Then on the Fourth of July, it had rained and the party was inside. Uncle Stuart had managed to push his coaster across her new alder dining table so hard it took 3 hours of sanding and 4 coats of urethane to repair the damage. This year, she was taking no chances....the listing said the coasters were unbreakable, scratch proof and relatively safe as flying objects...they were considered kid proof. She just hoped they were Uncle Stuart proof.